This heavy-duty fabric bag holds the CM120. The 19192 tote can be carried in one hand. The 19282 are used with the CM120 Guy Wires. In areas not subjected to higher wind speeds, the guy wires are run from the mast to the feet of the tripod. These extension anchors allow the guy wires to be anchored at points further from the center point of the tripod thereby increasing the rating of the tripod for higher wind speeds. The 25699 Guy Duckbill Heavy Duty Anchor Kit is recommended for areas with aggressive soils. Aggressive soils have resistivity of less than 3000 ohm-cm; pH of less than 5; chloride of greater than 1000 ppm; sulfate of greater than 500 ppm; or poor aeration. 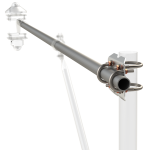 The CM216 Apex Sensor Mount provides a 3/4" or 1"-IPS mounting pipe that extends 4" above the mast. It allows a sensor with a 1.0"- or 1.32"-OD fitting (typically a wind sensor) to be attached to the top of this tripod. The CM202 is a 2-ft crossarm that provides a rugged, weather-resistant sensor mount for one sensor (typically). The CM203 is a 3-ft crossarm that provides a rugged, weather-resistant sensor mount for one sensor (typically). The CM204 is a 4-ft crossarm that provides a rugged, weather-resistant sensor mount for one or two sensors. The CM206 is a 6-ft crossarm that provides a rugged, weather-resistant sensor mount for one or two sensors. This guy kit is included with CM120 purchase. The 19240 can be ordered independently of the tripod in case one is needed for replacement purposes. This kit is included with the CM120 purchase, but may be also ordered as an replacement item. The 19238 consists of a lightning rod, ground rod, and components to connect the datalogger enclosure and tripod to the ground rod. The 17049 may be purchased to replace a lost or damaged spike. This clamp attaches a grounding rod onto the tripod, tower, or ET pole. The 2830 may be purchased to replace a lost or damaged clamp. The 2832 may be purchased to replace a lost or damaged grounding rod. Properly grounding a tripod or tower helps protect the equipment from lightning. This 4 AWG copper wire typically connects a ground lug to a ground rod. You can order the 2833 in custom lengths for replacement purposes or for non-standard applications. This 12 AWG copper wire provides a ground lug-to-tripod ground connection. The 2834 orders the copper wire only; hardware for attaching the wire is not provided. This clamp attaches the lightning rod onto our tripods and towers. The 1013 is shipped with our tripods and towers, and it may be purchased to replace a lost or damaged clamp.